Have you been noticing a shift in the yoga community lately? There’s less talk of Instagram filters and more talk of self-acceptance and body positivity. The focus is falling off of asana, and onto how best to nurture our body and souls (which sometimes means less down dog, and more cups of tea). The emphasis on going as fast as possible through a sun salutation is fading away to reveal more value in spending quality time in meditation. We are less defined by a size and shape and more defined by the size of our hearts and shape of our compassionate values. These are shifts I’ve (not-so-)patiently been waiting for (and talking about) for a very long time. I even wrote a book about it – Yoga Beyond the Mat. Many years ago, I started to feel this deep desire to move my practice beyond the mat, but I was scared that I would lose my identity as a yogi as a result. What happened was exactly the opposite. By pulling our practice away from the crowded yoga room, not looking in the mirror at the studio, and stopping the comparison of ourselves to others…something magical happens. When we quit posting images of our practice during practice to our social media feeds, and actually immerse ourselves in sadhana instead…something powerful occurs. When it’s not about your physical ability, but your ability to open your heart and deepen your connection to life…something beautiful is realized. Yoga–the psychospiritual state of bliss and connection–is what lies beyond comparison, judgment, and distraction. Strangely, sometimes the common yoga model of crowded classes isn’t always conducive to this state. Which is why it is so important that we have our own space to allow for the state of yoga to arise. The good news is that it is possible for everyone. Yoga is our natural state. It is who you are. There is actually nothing to “do.” The only thing we can “do” are practices that allow for the natural state of yoga to arise from within. Do you know what those practices are? Not warrior 2. In all the years I’ve been teaching and practicing yoga, I’ve never actually seen anyone enlightened in a warrior 2! The practices that reveal our natural state of yoga are the ones that make us feel most connected. Practices like: personal ritual, gratitude, meditation with invocations, and being kind. Headstand has very little to do with your yoga. 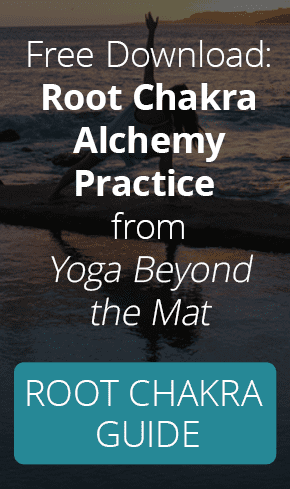 This week, I taught you more about how to take your yoga beyond the mat and create a personal practice that helps you to connect to your own innate source of bliss. Watch Facebook live (below) where I told you exactly how to take your yoga beyond the mat and start tapping into yoga itself–the psychospiritual state of bliss and connection. You can see a replay of the Facebook Live below. It’s an exciting time to be a yogi! People like you are the key components of moving yoga forward and shaping how it looks for future practitioners. Thank you for being a part of the movement to take yoga beyond the mat, and for being an integral part of my tribe of #ModernMystics! If you want some support on getting started building a daily personal practice that allows for the state of yoga (bliss) to arise, I have a special 14-day email course that will guide you through putting it together. Click here to enroll in the 14 day Yoga Beyond the Mat email course. You can also find guided practices in my book Yoga Beyond the Mat and my course Yoga Beyond the Mat: Making Yoga Your Daily Spiritual Practice.